Manufactured from sodium silicate, Silicagel is porous silicon dioxide and one of the high-quality absorbants. Due to the nanometer size of pores in its structure, it has a high surface area. Can be used in any spot that is desired to be dry and soaks up moisture in high efficiency. Silicagels that we produce are designed with great care and aiming to get high rendement. Our products are inert and absolutely non-toxic. Dry and safe storage of many sensitive materials. The most common dehumidifier used in the world with its high moisture absorption ability. Due to its inert structure, it does not react with any materials or chemicals and cannot be affected. If gets mixed with transformer oil, it does not affect oil quality and is used safely. No dusting or mudding, it is a clean and safe application. Rapidly avoids densification and humidity at extended temperature ranges. Color: Transparent White, Blue or Orange. 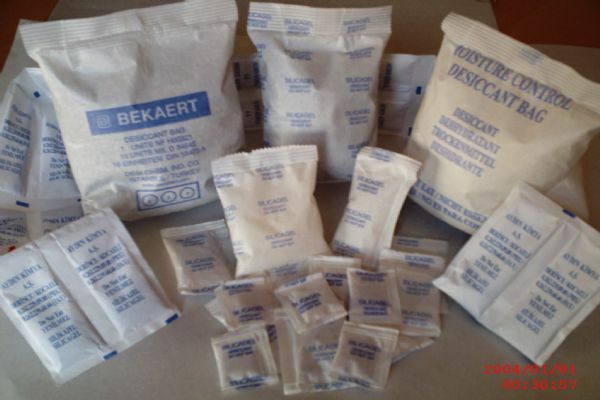 By using special non woven packaging material with breathing capability, it is produced and sold in different weights, sizes, presses and quantities from 1 gr to 500 gr which is customized to the buyers request. To avoid moisture until the time of use, our dehumidifier products are confined in vacuum packaging during production and sent in cardboard boxes. Offered in customized grammage in double layer polyethylene package. There are 3 types: white, blue and orange. White silicagel does not contain indicator and color change does not occur when material starts to work, which means that, moisture cannot be visually observed. Contains Cobalt Chloride. As the amount of moisture absorbed increases, its color becomes pink. By virtue of this feature, silicagel can be monitored whether it has moisture or not, or working and completes its function. Orange silicagel is a new generation silicagel produced by using organic indicator chemicals. Because of its organic content, it is friendly to human health and the environment. As it soaks up moisture, the orange color turns to white or green, depending on the type of the indicator. How Much Silicagel Should I use? In accordance with MCO P4030.23F standard, the recommended application amount for silicagel product which provides protection against corrosion by adsorbing moisture in closed volumes is 1 kg for 1 cubic meter volume. With the help of the calculation formula below, you can reach the amount that you need to apply. How should I apply Silicagel? When packing your material to transport safely or to protect your assets in the process of storage, you should pay attention to the following points during the application of our silicagel product. - The silicagel package must not contact with air until it is applied. The silicagel package should be stored in polyethylene bags. - If the polyethylene wrapping is torn or pieced, do not ever use it. - The wrapping of the material you want to protect by applying silicagel should absolutely be air insulated. - Remove the silicagel package from the transparent polyethylene outer wrapping (never open the inner wrapping) and place it in the package you have placed in the material you want to preserve. Close the wrapping as soon as possible so as not to catch air.